King Edward VII Bridge is a railway bridge which was opened in 1906. 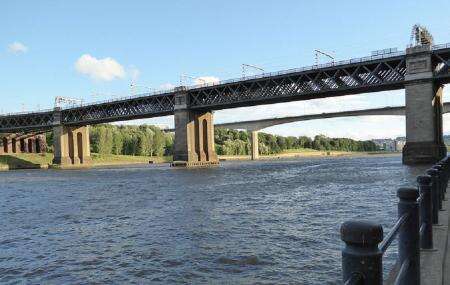 The bridge runs over river Tyne and is built between Newcastle upon Tyne and Gateshead. It spans over a total length of 1,150 feet and stands at a height of 112 feet above the river water. This bridge is a known local landmark and is a fine structure to observe. Create a flawless plan, make use of Newcastle Upon Tyne trip planner. You can enjoy a comfortable stay in the city by booking the best hotels in Newcastle Upon Tyne like New Northumbria Hotel, Ramada Encore Newcastle-gateshead, Waterside Hotel and Caledonian Hotel. Choose from variety of exclusive Newcastle Upon Tyne vacation packages for your next visit or create own own. Check out the various options for how to reach Newcastle Upon Tyne and finish off your vacation package by booking the ideal transfer. Love this? Explore the entire list of places to visit in Newcastle Upon Tyne before you plan your trip. Fancy a good night's sleep after a tiring day? Check out where to stay in Newcastle Upon Tyne and book an accommodation of your choice. How popular is King Edward Vii Bridge? People normally club together Beamish Wild and Craghead National Spiritualist Church while planning their visit to King Edward Vii Bridge. This is possibly the greatest bridge in the entire world! It was built by the Victorians purely for the entertainment of the passenger on a train that is waiting for a platform to become available at Newcastle Central Station. It is a little known fact that there has been a bridge on this site since the days of King Arthur and Merlin. One day Merlin woke up and said "Arthur we need a bridge on the Tyne and the fog will be yours". It took Arthur and merlin over ten weeks to build the first Tyne bridge and two years later they were stuck on a train when searching for some legendary cup (allegedly) when merlin turned to Arthur and said "that bridge you told me to build looks good, now where's my f*****ing fog? ", to which merlin replied "the fog on the Tyne is all mine, all mine", "I keep it on a jar in my kitchen!". It's a bridge ffs, but does the job it was designed for. Nice bridge on a nice walk along Tyne river on the Hadrian way. Google has got it's placement marker wrong. This is the High Level Bridge, not the King Edward Bridge. The King Edward bridge is 2 bridges up river.